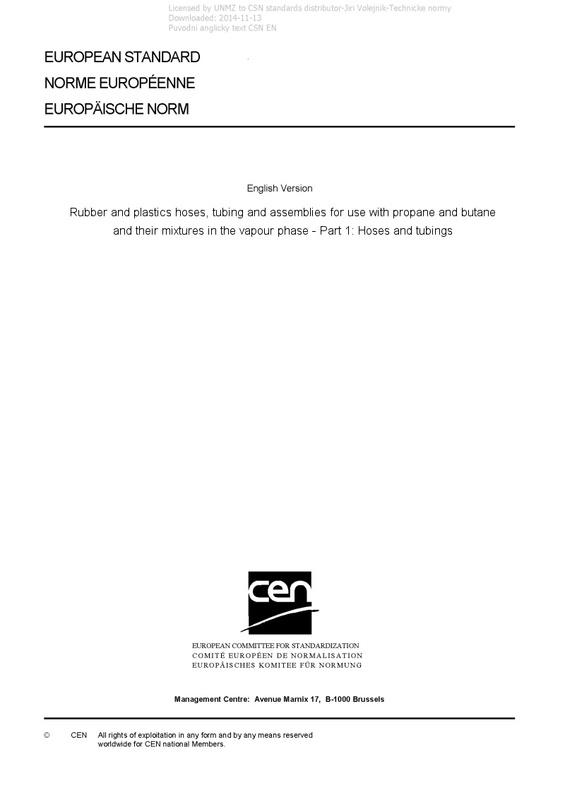 EN 16436-1+A2 Rubber and plastics hoses, tubing and assemblies for use with propane and butane and their mixtures in the vapour phase - Part 1: Hoses and tubings - This European Standard specifies the characteristics and performance requirements for tubing and hoses made of either rubber or plastics for use with commercial propane and commercial butane and mixtures thereof, in the vapour phase, for connection of appliances, from: - pressurized gas container to a regulating device, - pressurized gas container to an appliance, - regulating device to an appliance, and - regulating device to installation pipework, in environments of a temperature range from -30 °C to +70 °C. Working pressures are from 0 bar to 30 bar. Three classes are defined in Table 1 according to the maximum working pressures and minimum ambient temperatures. This European Standard only covers the tubing or hose part of assemblies. The assemblies themselves will be covered by EN 16436-2. This European Standard does not apply to hoses for: - welding purposes (see EN ISO 3821, EN 1327); - propulsion purposes; - LPG transfer purposes (see EN 1762).